The first attraction in this area was called How to Make a Mega Movie Deal and it opened a year after the park opened, in the Spring of 1991. The attraction was a small exhibit themed to the movie industry, and included many exhibits, games, and videos about the industry. It also featured a small storyline of a man progressing from a Mail Room employee to a studio executive in Hollywood. The exterior facade of the building was themed to The Hollywood Hotel in Los Angeles, California and The Garden of Allah in Hollywood. Shortly after opening the attraction was renamed AT&T at the Movies, but retained the How to Make a Mega Movie Deal story as the attraction finale. AT&T at the Movies was an interactive attraction that now included various AT&T-based technologies and dropped the How to Make a Mega Movie Deal portion in the mid-nineties. It featured small exhibits that allowed guests to play games on touch screens, watch videos about new technologies, and even test one of the first-ever video phones (well before Skype ever existed). They also had a robot arm to show off in the back of the room, and it always drew a crowd. AT&T at the Movies closed in 2001. The inside of the attraction area was renovated to make way for the quick-service restaurant Cafe La Bamba. The legendary Hollywood Hotel has been transformed into this Southwestern eatery featuring Ribs, Chicken, Buritos, Tacos, and Salads. Stop by Carmen’s Veranda for cool refreshments. The venue went through years of closures and re-openings until finally settling in on its seasonal status (check your park map to see if it’s open). In the summer of 2012 it became home to Universal’s Superstar Breakfast, offering guests a chance to meet some of their favorite characters like Spongebob Squarepants! For a brief period, the original entrance to AT&T at the Movies was used to house the self-service Express Pass distribution machines. This was before Express became a solely paid-for system. Guests were able to get free Express passes to the Woody Woodpecker’s Kids Zone area attractions including E.T. Adventure. The Express Pass machines were removed in 2007. Since then, until now, the area that remained was kept-up on the outside. The facades remained intact. The inside space near the former attraction entrance has been used for storage and custodial supplies, while the larger indoor space remains open as the restaurant. Personally, I have always enjoyed walking through the pretty walkway to get from the main path to the area near ET more quickly. This was a nice area to relax, have a seat, or just cut-through, away from the busy foot traffic of the park. Many people on the internet forums, podcasts, and chatrooms seem to think we’re going to see a museum of sorts put in this area to coincide with Universal Orlando’s 25th anniversary this year. And while I think it would be cool to see things like models, trinkets, plans, and mementos of years’ passed, similar in nature to One Man’s Dream at Disney’s Hollywood Studios, I personally do not think that is what this area actually has in store for us. More likely, what it is starting to look like, is that they’re building a bypass entrance to E.T. Adventure. There have rumors for years that Woody Woodpecker’s Kids Zone is next on the chopping block. If they’re ever to tear that area down and start fresh, they’re going to have to do something about ET. I for one do not want to see ET closed, and it still packs in a pretty good crowd, especially considering it’s the only original ride still standing in the park 25 years later. By creating an entrance to E.T. 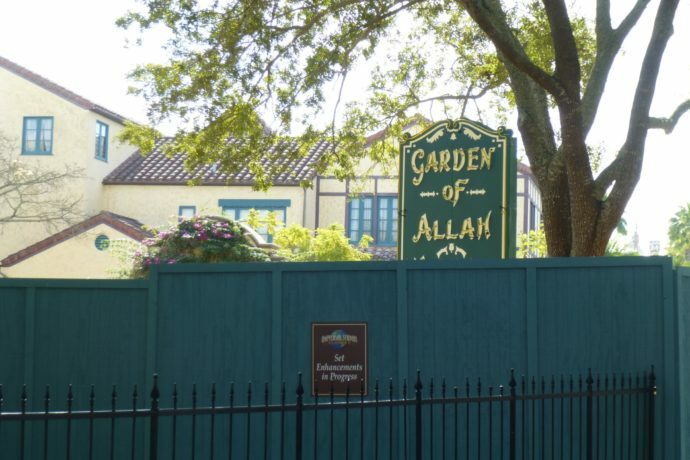 Adventure through the Garden of Allah area, they will be able to wall off the area from Spongebob Storepants to the Animal Actors show. 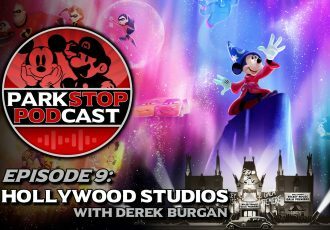 They will be able to close (and demolish) Fievel’s Playland (a completely outdated area), and re-purpose/replace/renew Woody’s Nuthouse Coaster, A Day in the Park with Barney, and Curious George Goes to Town, all while keeping ET open and unaffected. UPDATE: It looks like this will definitely not be a new entrance for ET. It’s going to be something called the NBCUniversal Media Lab. More information available here. No one knows for sure what I.P. will be taking over the area, or if Woody Woodpecker’s presence will remain, but everyone agrees it’s time for a change in the area. Whether it’ll be Spongebob, Scooby Doo, more Minions, or any combination of characters, I’m welcome to the change, and can’t wait to see how it all turns out. I’ll keep up with construction updates on the blog as things start to change! The view on the corner, no construction walls here, so maybe no changes? Could a walkway to ET through the backlot area be added behind this wall? That’s all for this update. Check back again soon for more updates! Subscribe to the feed to keep up.